Who should bear the cost of quality? Marine Renewables — Will the UK drop the ball (again)? 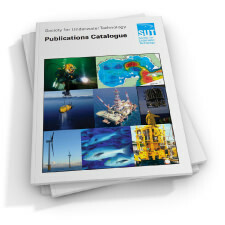 Abstract: This paper reviews the contributions of underwater science in continuing to develop new technology to explore the marine environment and how collaborations taking place between the oil and gas industry and science are facilitating this process. A case study focuses on some of the results and highlights from the SERPENT Project. SERPENT (Scientific and Environmental ROV Partnership using Existing Industrial Technology) is a collaboration programme that was designed to make better use of remotely operated vehicle (ROV) technology and data available through links with marine operations in the oil and gas industry. Oil and gas exploration and production activities in the marine environment are increasing. The amount of global hydrocarbon reserves removed from below the seafloor is set to increase over the next 5–10 years with exploration heading into deeper, more remote waters, many of which have yet to be fully explored. The only way that these remote areas may be documented is through a working relationship with industry, with mutual benefit for both sides, and learning from technology that is already in place for the benefit of science. 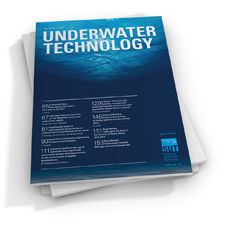 Abstract: Considering the influence of underwater ambient pressure (UAP) on underwater hydraulic motors (UHM), and utilising the state–of–the–art of pressure compensation of underwater hydraulic systems (UHS), this paper proposes a pressure compensation technique for the UHS where the hydraulic power unit is installed inside a deep diving submersible or a submersible drilling platform with atmospheric pressure, some actuators of which are directly surrounded by seawater and others are installed inside it. 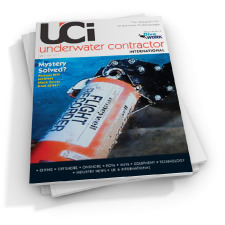 An underwater ambient–pressure–compensation valve (UAPCV) has been developed. The pressure in the return line of the external sub–circuits of the UHS is compensated by this UAPCV, but not that of the internal sub–circuits. Theoretical analysis, simulation and experimental results show that reliable pressure compensation can be ensured with a small flow–rate by the UAPCV. The operational performance of the UHM is further improved after its leakage pressure and return pressure are compensated. Abstract: A set of procedures has been developed to allow preliminary estimates to be made of underwater noise and its effects on marine species. They do not require detailed acoustic survey data, either of the site or of the proposed plant. However, they still facilitate the comparison of different project proposals to assist in the optimisation of equipment layout and routing. Noise may be due to specific sources, such as ships and marine equipment, or assessed as a general background level. Some aspects of acoustic analysis applicable to more detailed environmental impact assessments are also described, particularly relevant when comparing noise spectra with audiometry data appropriate to different species of wildlife. Abstract: Closed–circuit rebreathers (CCR) have been used for many years in military diving but have only recently been adopted by technical leisure divers, media and scientific divers. Rebreather divers appreciate the value of training, pre–dive checks and equipment maintenance, but it is often difficult to visualise just how important these factors are and how they inter–relate for a rebreather. 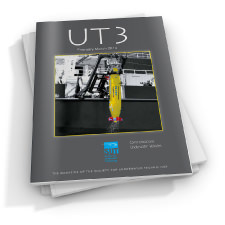 In this paper, the well–known technique of fault tree analysis (FTA) is used to identify risk in a rebreather. Due to space constraints, only the branch of the tree for unconsciousness as a result of hyperoxia is considered in detail but, in common with the whole tree, end events are shown to be human–factor related. The importance of training to the emergency situation, the use of formal pre–dive checklists and the value of good design to prevent accident escalation are discussed further. 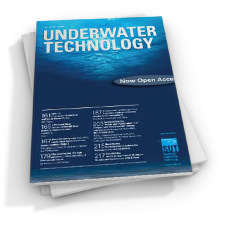 Abstract: For remotely operated underwater vehicles operating in the vicinity of offshore platforms, the object recognition and detection of cylinders is of importance because many platforms are constructed from connected tubular elements. This paper briefly reviews acoustic cameras and then presents a cylinder–based model matching procedure for 3D underwater acoustic camera images. Cylinder identification is achieved using a combination of information from the 3D acoustic image and the 2D intensity map. The paper concludes with some sample results of images of a scaled oilrig structure captured using a 3D acoustic camera. Abstract: The problem of a viscous flow past a submerged source starting from rest and moving with a constant velocity, below and parallel to a free surface, is examined and asymptotic expressions for long–time evolution of free–surface elevation are obtained. The results show explicitly the viscous effect on the free–surface elevation and no surface tension effect on the asymptotic wave. Abstract: Analysis of archaeological sites stratified within marine sediments can open a window to cultures that are now lost between the waves. These sites and their environmental context harbour a resource that can also provide index points for sea level rise during a period of acute climate change. A decade of archaeological investigations in the western Solent by the Hampshire and Wight Trust for Maritime Archaeology, utilising divers and geophysical survey data, has led to the discovery of Mesolithic sites within submerged landscapes. They lie between 6.5m and 11.5m below British Ordnance Datum. However, the discovery of these delicate and vulnerable sites is presenting new challenges to the maritime archaeologist. The need to record, rescue and interpret the remains underwater sampling techniques.